Editing has come along way over the years as technology gets smaller and smaller. However nothing surprises me more than the ability to edit 720p footage from the iPhone directly on my iPhone for free. That’s right I said free!! Normally, you have to use a paid program such as iMovie, or Import the footage into Final Cut Pro. But there is a great app on the iPhone called Splice, and its a free download. The application allows you to edit your films in a user friendly manner. Splice has a great tutorial built into it for those of you not failmar with NLE’s. Splice sets up similar to any NLE by creating a project, and naming it. From there it is a simple as adding the either the photos, or video you want to the timeline. By selecting the small gear in the top left you open another window with options for project settings. There you can select either HD or SD, timeline with HD 16×9 and SD as a 4:3 project. You can also set the orientation to either portait or landscape, there is even an option for different borders for your final output. 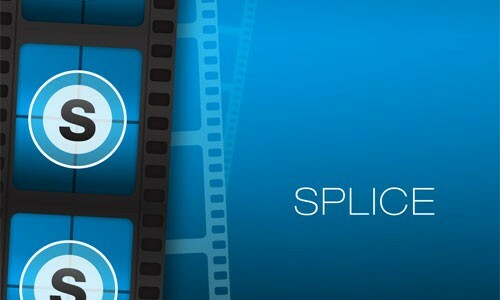 Splice also provides you with some great transtions for editing. These include transitions such as crossfade, to grow and shrink transitions. They also provide you with a tool for creating a basic titles, that can be postioned accordingly. Splice has taken editing very seriously here, because they have also provided you with some temp music, and sound effects that can be added to the soundtrack. This was a huge surprise!! I can’t believe this app is free!! Of course you can always add your own music from your library if you choose to do so. Once you are happy with your edit, its time to export your timeline. Splice gives you 2 options, a medium size file at 960×540, or a high res file at the full 1280x720p. Simply choose one click export, and it begins to render out your final project. Astonishing! Update : Thanks to Michael Schmidt for pointing out that Splice also has the ability to trim, adjust speed, crop, scale, and duplicate your video clip, all with the simple pen tool. For those of you in love with the KenBurns effect, it’s there as well. This application is simply fantastic!! Here you get more for what you paid for, which is nothing! I can’t believe I can edit 720p on my iPhone! Now if a devloper can create this, what is stopping Apple from making an iPad version of Final Cut Pro? Maybe that’s wishful thinking, but considering my career beginning at neg cutting, to large tape to tape ediing, to desktop, to Macbook Pro, to now having the ability to edit on the iPhone is a testament to progress. It seems the tech for editing keeps advancing, leaving us with the joyous task of concentrating on the craft of cutting. That is a great article and I’m glad you finally are enjoying mobile editing. But I remember specifically when the ability to edit came out for the iOS platforms you were very negative staidly it. Basically mocking it and anyone that was going to use it for anything serious. Why the change of heart now? Well, If you take a look at my iPhone 4 film you can see I am not opposed to it. I am impressed by its abilities in a such a small form factor. That being said… I would never use this for editing anything else other than iPhone footage. It is not a “serious” editing tool. That is what Avid, Final Cut Pro and Premier Pro are designed for. What is your definition of “serious”? Able to make money with it or entertain using it? Cause I fail to see how you are not able to do either. You made a very enjoyable short film and if someone chose to expand on it could probably make a VOD rental worthy film. So again where is the “serious” aspect that you cant do? Special effects? Sure you can’t do that. But if you tempered your expectations that doesn’t mean it isn’t a viable medium to use to edit and be successful with. Well, use the best tools that gets the required job done. That’s a great idea… I never thought of using it for a preview tool…. for pre-production…. great thinking!!! I wanted to thank you for this great read! I definitely enjoying every little bit of it. This is such a amazing site you have. Your website has been a great guide. Thanks. Ive been looking for a good review. Keep up the good work and Thank you again. Agreed this app is killer, however, with the new iMovie it might be hard for this any other app to gain popularity. But of course thanks to folks like you that are bringing products like this into the open. Hard to beat an editing program that give to lower third graphics that go in and out, like after effects. These days folks need wizbang flashy videos, unless you are kid 12-25 looking for folks hurting themselves on YouTube. I will say though that I have edited in iMovie and then transferred to slowmo app and then ended in splice for a cool frame around my work. Splice allows you to use multiple audio tracks which most template editors don’t. I highly recommend this app in your on the spot, video app arsenal.